Make the Chutney: Put all the chilies, pepper, mint, lemon juice, garlic, sea salt, and black pepper into a blender and blend until smooth. Add the almonds and blend again. Pour into a bowl, adjust the seasoning if necessary and mix in the dill. Combine the chickpea flour, baking soda, and sea salt in a large bowl. Slowly mix in the water to get a thick batter. Add the black pepper, cayenne pepper, cumin, shallots, coriander, and shrimp. Stir and mix well. Put the oil in a frying pan and set over medium heat. Line a baking tray with paper towels. When the oil is hot, pick up 1 heaping teaspoon of the batter and release it into the hot oil with the help of another teaspoon. 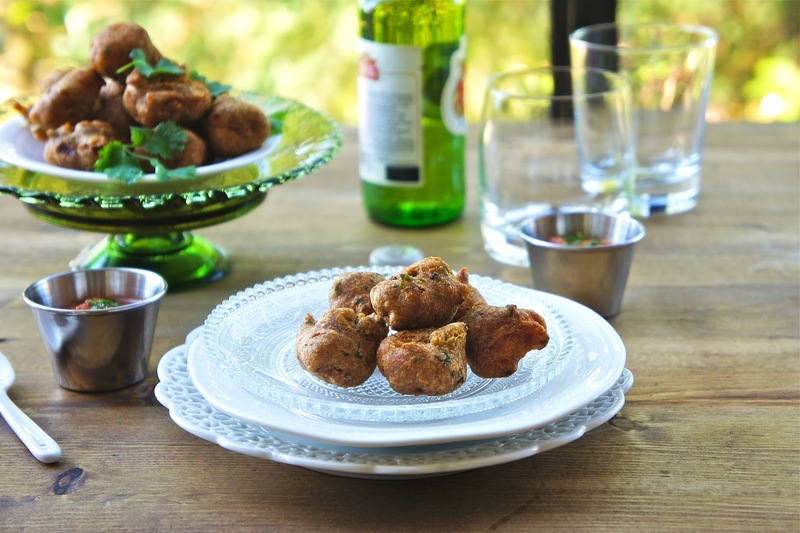 Fry fritters for about 6 to 7 minutes or until they are reddish or golden brown in color. Remove the fritters with a slotted spoon and drain on the paper towels. Make a second batch the same way. Serve hot with red pepper chutney. Makes about 25 to 30 fritters.